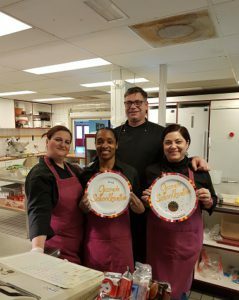 The canteen of our school, Luna Rossa, has won the Golden School Canteen Plate 2018. This means that they have fulfilled the requirements of the Dutch Nutrition Centre for a healthy canteen. They found that the canteen has worked hard again to become healthier. A healthy appearance and a healthier offer of sandwiches, fruit and vegetables are central in the canteen and there is always water available. “Healthier Canteens” is a long term project of the Nutrition Centre on behalf of the Ministry of Public Health and Sport and the goal is to have a healthier food supply at schools. We are very proud and we congratulate the canteen with this reward.